The Flower Fields® history is almost as colorful and enduring as the vibrant blooms. It is a story steeped in pioneer spirit, a persistence for perfection and, above all, a lot of long, hard, dirty work. It is also the story of Ed Frazee, thought of as the father of The Flower Fields®. Frazee, now 82, remembers seeing ranunculus blooms for the first time in 1922. His father, Frank, was growing English peas in a Carlsbad field near Tamarack Avenue for horticulturist Luther Gage. When Gage was gone, Frank Frazee would water the flowers that grew in the garden, and among them were some beds of ranunculus. A few years later, a fire destroyed the Frazee ranch on the inland shore of the Agua Hedionda Lagoon, and the family moved to Oceanside, where Frank began growing freesia bulbs to make ends meet. Freesias were in high demand, and Frank grew them on land he leased from the city. In 1932, he added ranunculus and introduced his son, Edwin, to the art of seeding. By age 16, Edwin quit high school to work full time at his fathers burgeoning flower operation. Over the next several years, Edwin Frazee settled into the farming life, expanding his fields on what eventually would become Camp Pendleton. He became adept at improving his ranunculus crop, and by the 1950s he eluded his competitors by breeding a superior ranunculus bulb with an unprecedented infusion of petals, known as a double. This made him the only commercial ranunculus grower in the U.S. Frazee concluded that ranunculus thrived best in a mild climate and sandy, well-drained soil. He decided to expand his crop to a coastal slope in Carlsbad overlooking the ocean and Highway 101. This field of vibrant, seasonal color attracted the growing number of motorists traveling between Los Angeles and San Diego, and quickly became a tourist attraction, even gaining the attention of photographers for National Geographic. Frazee and his workers soon found much of their time taken up by visitors helping themselves to free bouquets of gladiolus and ranunculus. By 1975, Edwin Frazee retired, leaving the business to his sons, John and Jim. Soon after, the Flower Fields were moved a few miles north, off Palomar Airport Road just east of the Interstate 5 freeway. The land was owned by Carltas Co., the land division of the Paul Ecke Family, and for years was used to grow the Eckes world-famous poinsettias. The location offered a magnificent sea of color to motorists and, for awhile, seemed to be the perfect arrangement between the two renowned floral dynasties. However, without Edwin Frazees enthusiasm, son Jim eventually determined the fields were not cost-effective and, in 1993, asked Paul Ecke Jr. to terminate his lease.For the first time, Carlsbads famed flower fields faced extinction. The news was disturbing to Mr. Ecke because the fields represented a continuing part of the floral business that the Ecke family had pursued for years, and also figured prominently in Carltas plans to develop the surrounding area (which became known as Carlsbad Ranch). The flowering fields were to be a landmark gateway to adjacent projects that included the Legoland California theme park along with championship golf, a resort hotel and the Gemological Institute of America. In August 1993, Carltas secured a loan from the California Coastal Conservancy to provide the capital necessary to keep the fields running for at least two more years. A venture to take over 50 acres of ranunculus was formed by Carltas and Mellano & Co., a prominent grower in the San Luis Rey Valley. Edwin Frazee was personally persuaded by Ecke Jr. to come out of retirement and provide knowledge about growing the crop, which now includes spreads of gladioli, watsonia, sparaxis (Wandflower), oxalis (Blooming Shamrock), babiana and tritonia. 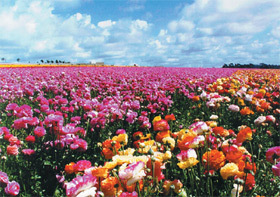 Hence, The Flower Fields® at Carlsbad Ranch was born. Today, the operation represents the perfect synthesis of a robust working ranch and regional tourist attraction. Ample parking, a garden center, special events and tours provide easy access, historical information and floral products to over 150,000 visitors a year. FlowerFields in Carlsbad, Californa is the largest independent garden center in the Western U.S.
For eight weeks each spring, on coastal farmland in Carlsbad, California, 50-plus acres of Giant Tecolote® Ranunculus flowers bloom and transform the landscape into a solid expanse of vibrant, banded color. For those living in the region, color in The Flower Fields® signifies the beginning of springa reliable and welcome rite of renewal and regeneration. The Flower Fields®, in partnership with Armstrong Garden Center, is the largest independent garden center company in the Western U. S., and offers a unique experience for those who delight in these beautiful blooms. Opened last year, the new, 33,000- square-foot, state-of-the-art facility offers various retail activities, including seasonal displays and special gardening events. Garden accessories, gifts, clothing, ranunculus blooms, garden art, and a full line of The Flower Fields® garden plants are for sale. An All-America Rose Selection test garden and All-American Walk of Fame, featuring all 173 past AARS winners since 1940, will debut this year. Other featured attactions this year are The Flower Fields® Theme Gardens. Five new gardensSun, Shade, Cottage, Cutting and Fragrancewill feature The Flower Fields® line of flowering plants. They will be as instructive as they are beautiful. For additional information and directions, call (760) 431-0352. Frequently Asked Questions & Answers - Back in school, our teachers taught us to ask questions and reminded us that the most foolish questions were the ones not asked. 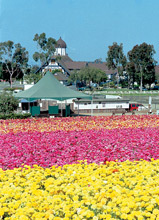 The Flower Fields® in Carlsbad is delighted by spectators genuine interest in their operation! Over the years, they have compiled a list of most asked questions. Curiosity about the flowers, the bulbs, the ranch and the spectacular view has aided their effort to publish this information. Here are some of the most-asked questions. What kind of flower is grown there? It is called the Tecolote® Giant Ranunculus, which is one of the finest strains of ranunculus plants in the world. The ranunculus flower is native to Asia Minor and is a member of the buttercup family. This unique blossom is also known as a Persian Buttercup or Ranunculus Asiatic. Over 50 acres are devoted to raising the ranunculus bulb crop. Approximately 5 acres are used for gladioli, while the watsonia and other flowers utilize about five acres. © Copyright South Coast Magazine. No unauthorized duplication without written consent.